If you’re just dying for a fear fix this Halloween, look no further than The Museum of Horrors, returning to *SCAPE this year in 3D from 21 October to 2 November. Created by the Movie Mania gang, this Halloween show in the heart of Orchard Road promises to be a “monstrous exhibit of horrifying proportions”, featuring more than 20 interactive sets and dioramas depicting some of Hollywood’s most terrifying monsters. 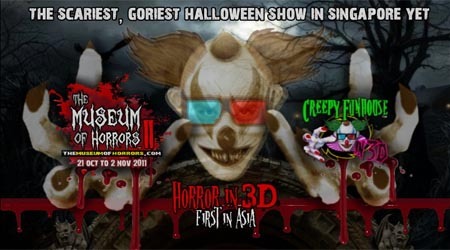 This year, The Museum of Horrors also features a 3D horror fun house – the first of its kind in South East Asia, so be prepared to be scared. Be sure to check out the official site for more details! Cosplaying a character with a weapon prop’s easy, but putting on an actual performance where you’re swinging that prop around instead of standing in a corner looking pretty’s gonna really tax you unless you’re already proficient in its use. Swishing Black Gold Saw’s sword about without a whit of finesse, or if you’re attempting, and failing at stabbing with a rapier, it’s going to look really, really awkward on stage. What’s worse, if you’re in a group competition, and you’ve decided to stage a fight without any prior knowledge or training (just look at some of this year’s entries), it’s definitely gonna show if your fellow contestants possess kickass kung-fu and have you totally outclassed. But fret not. In this week’s cosplay tutorial, we’re gonna touch on Stage Combat basics. Meet Bob. 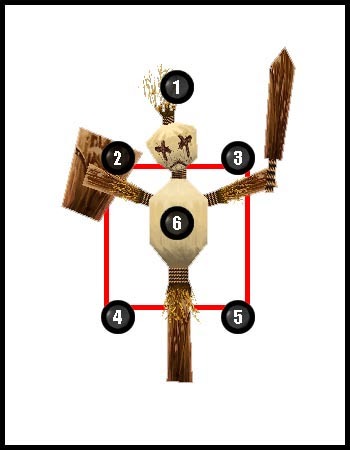 Bob’s a target dummy from World of Warcraft, and he’ll help us explain the concept of strike zones. Say 'Hi!' to Bob, our target dummy. If you’ve ever played fighting games before, you’d have heard of something called a ‘hit box’. Strike zones in stage combat are kinda like that. 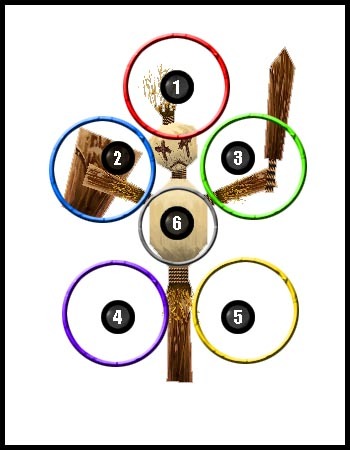 The body can be divided into 6 areas (just check out those colored circles), and these correspond to 1) the head, 2) the right torso, 3) the left torso, 4) the right flank, 5) the left flank, and 6) the midriff. By coordinating and defending against attacks to these regions, it’s possible to create actual sequences suitable for the stage. A strike pattern’s kinda like a combo. It’s a series of attacks focusing on different strike zones that are executed in tandem. a. The Square – A series of four attacks to 2, 3, 4, 5.
b. The Triangle – Three hits to 2, then either 4 or 5, then 3. There’s also a Reversed Triangle, striking at 1, then 4, then 5.
c. The Diamond – A solid blow to 1, then 3, 2 and either 4 or 5.
d. The Cross – Consecutive cuts to 2, 4, 3, 5. These strike patterns are named loosely after the shapes they form when you join the targeted strike zones with imaginary lines, but there’s no reason why you can’t give them funky names like Caligula’s Advance or The Fourfold Petals of Anubis either. It sounds way cooler when you’re improvising on stage, and map a character’s signature moves to a particular strike pattern together with the requisite anime-esque yelling of special move names. Just make sure you’ve plotted out the strike zones you’re targeting first, so your performance partner doesn’t get flustered and forget their moves! If your weapon prop is light (or hell, even if it’s heavy), consider introducing physical weapon spins and twirls into your performance. These flourishes are flashy, and look great on stage. Also, if your costumes permit, you can also incorporate simple stunts such as dodges, rolls and jumps into your performance. Such actions serve to add a level of flair and sophistication to your performance, greatly heightening its dramatic appeal. Now that you know the basics of stage combat, here’s a little exercise to get you warmed up. 1. Grab a 6-sided die (d6), and roll it 12 times. Note down the results on a piece of paper. 2. Each number corresponds to a targeted strike zone. For example, if the first four numbers you rolled were 5, 6, 6, 1, then they represent strike zones 5, 6, 6, and 1. 3. Using the results of your die rolls as a guide, create a short combat sequence of 12 moves. Until next time, cosplay friends. Comics Xchange (CXC) 2011, an initiative that brings seminars & workshops about the comic book business, a bazaar, and Singapore’s 2nd 24 Hour Comics Day together kicks off at Goodman Arts Center this coming weekend. Organized by the Association of Comic Artists Singapore (ACAS), local writer Moontique and Story Kitchen, Comics Xchange 2011 promises two days of fun, entertainment and enlightenment for participants, so check out the CXC website for more details. It’s a cosplay friendly event, so if you’re starved for an opportunity to strut your stuff in your favorite togs, you’re welcome to. Comics Xchange takes place at Goodman Arts Centre on 1st & 2nd October 2011. Doors open from 10 am to 8 pm daily. Fright Night: It's got bite! They’re emo and effeminate, they sparkle and glitter in the sun instead of going up like a pile of dry kindling, and they’ve all got about as much street cred as Justin Bieber. It’s a sorry state of affairs (Bram Stoker’s probably gonna turn in his grave if he knew), which is why the new Fright Night is such a gem. Helmed by Craig Gillespie, this remake of the 1985 cult classic puts a modern spin on the original though the story and despite the paradigm shift, the premise, at least, remains mostly the same. Instead of being a complete dork, Charlie’s (played by Anton Yelchin, who nevertheless looks like a dork) a cool kid now. He hangs out with the jocks, has a semblance of a life, and it’s high school nerd Ed who thinks there’s something wrong with Charlie’s next door neighbour Jerry Dandridge (played by Colin Farrell). Ed, of course, bites off more than he can chew, and that’s when things begin to get exciting. Naturally, it’s Colin Farrell who steals the first half of the show. His vampire is the quintessential nocturnal predator – tall, dark, handsome, fundamentally vengeful, and incredibly dangerous. It’s a nice change, seeing as how Hollywood emasculated the vampires in Twilight. His performance is mirrored by David Tennant, who plays Las Vegas illusionist Peter Vincent with the same kind of frenetic charm and irreverence that made him so endearing in both Doctor Who and Hamlet. There’s much to be said about the midori-chugging curio collector and charlatan (and also a fair bit of plot exposition to boot), but why read about it when you can actually watch it? 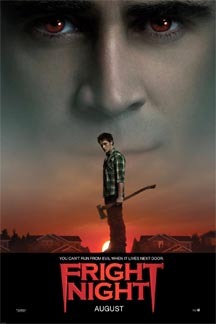 All in all a great movie, and probably one of the best remakes I’ve seen so far. I’m kinda keeping my fingers crossed for The Thing, but that’s another movie for another month. Don’t forget to check this one out, folks. And that goes double if you’re a fangboy. If you’ve read our Steampunk Goggles Tutorial, and if you’ve actually tried your hand at crafting a pair of your own, we’d love to showcase your work on The Neo Tokyo Project. 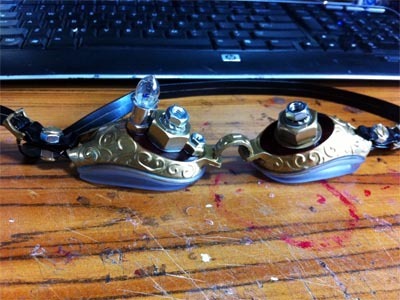 Simply post a picture of it on the wall of our Facebook fan page, label it “My Steampunk Goggles – by <YOUR NAME HERE>”. What’s more, the creator of the pair of goggles voted most awesome by our fans and readers will waltz away with a spanking steampunk prize. This contest closes on 31st October (that’s when voting begins), so get to designing and crafting if you haven’t! To start things off, here’s an idea from our part-time warrior Joey. My Steampunk Goggles - by Joey Lim. It’s a harsh and barren place that burns under the perpetual glare of the crimson sun, ruled by the ancient and immortal sorcerer-kings that were responsible for its desolation in the first place. 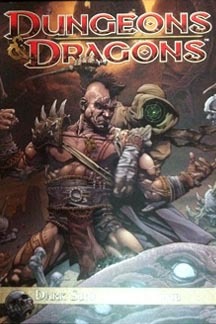 Written by Alex Irvine, Dark Sun: Ianto’s Tomb offers a glimpse into this post-apocalyptic Dungeons & Dragons (D&D) setting through the eyes of Grudvik, an ex-gladiator from the city of Tyr. Arrested on trumped up charges, the Mul (a uniquely Athasian race) escapes and flees into the desert, only to be confronted by a canny hunter named Aki, who co-opts him into what becomes an adventure of epic proportions. While the setup only manages to plod along in the first 20 or so pages, the art serves to do what the story initially fails at – painting a near perfect picture of the sparse, sand-filled wastes and the fierce struggle for survival that is life on Athas thanks to Peter Burgting. It’s a brutal world after all – no place for the squeamish – and the panels reflect that. Characters crush, kill and maim with abandon, but in keeping with D&D’s family friendly sensibilities, the bulk of the violence is tastefully masked (and takes place off screen). 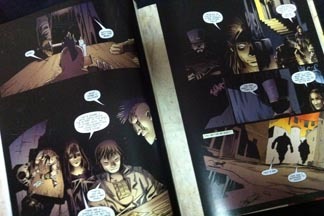 Check out the interior art and paneling. The story picks up later, when political intrigues and an ancient legacy wend its way into the plot and the search for Ianto’s Tomb begins in earnest. That’s when Irvine’s understated style begins to soar towards a satisfying pay-off. Like it’s core campaign counterpart, Ianto’s Tomb also features bonuses for D&D players. There’s encounter maps and scenarios aplenty, so if you’re an avid dice roller and you’re keen to play out Grudvik’s journey, it’s in there. All in all a great read for fans of gritty, low magic settings where strength of arms, wit and guile, rather than the size of your fireballs matter. Few comics have managed to swing it better. Now that you’ve got a killer script and an audio capsule prepped for your cosplay performance, we’re gonna talk a little bit about role-playing. Before you can strut your stuff and dazzle the stage, you’ve got to overcome the first hurdle – that nasty Q&A component that’s gonna test your ability to think on your feet – to portray your character without fumbling or looking like a complete goof. After all, even if you’re looking fly in your cosplay togs and you’ve got a horde of adoring fans waiting to vote you to victory, messing up with the RP monster’s gonna ruin your competition chances, especially if it’s a major scoring component. Keeping in-character is integral to cosplay. The minute you take to the stage, you’re no longer Johnny Milquetoast, cosplayer extraordinaire, but <INSERT NAME HERE>, the character you’re kitted out to be. You adopt <INSERT NAME HERE>’s gait, mannerisms and personality traits, heightening the illusion and creating suspension of disbelief. You’re even expected to answer questions IN CHARACTER. It’s a trick question, and it’s foiled even cosplay veterans, as recent competition vids   from TGX would attest. It’s a great way to catch you off guard, especially if your mind’s drawing a complete blank and you’re freezing in front of the audience due to stage fright. Be cheeky, be coy, but never, ever answer this question with “I’m cosplaying <INSERT NAME HERE>”. Instead, poke fun at the emcee, play with the judges, and demonstrate your 1337 acting skills by behaving just as the character would if he were in your predicament. Remember to ham it up, because you’re racking up points when you do. 2. Is that a big sword you’ve got there, or are you just happy to see me? What are some other potential pitfalls to watch out for? For one, if you’re asked about a particular prop, or why you like a costume, be sure to give it a bit of thought before you answer. Saying “Oh, I really love the character” or “I like the character’s outfit very much” is a big no-no because you ARE the character, and that dress or the prop you’re toting is something indispensable in <INSERT NAME HERE>’s arsenal. If the emcee’s on the ball, he’ll play right along. 3. Role playing. It makes all the difference. It’s not all that difficult to get in character. It’s a simple matter of practice, practice and practice. a. Start by making a list of <INSERT NAME HERE>’s base traits. Is he craven or brash? Is he confident to the point of arrogance, or is he shy and bashful? b. Next, try acting the same way for an extended period of time. Keep at it for an hour each day, or if you’re really confident about it, do it for an entire day at a go. c. Pick one attribute at a time. When you feel like you’ve mastered it, move on to another. Gradually, you’ll find that channeling the character’s not all that hard, and that you can fall into the role pretty easily. When that happens, you’ll be able to make the connection almost instantaneously, and you’ll never be caught flat footed on stage again. So get to practicing, guys, and don’t forget to let us know if this helps at all. Until next time, cosplay friends. Cheerio! If you were anywhere near Iluma yesterday afternoon, and was wondering what the hype in the lobby was about, it was Teenage Big Day Out 2011 – an event that saw aspiring models, K-pop dancers, and cosplayers vying for the right to be called Champion in their respective categories. The Teenage Cosplay component kicked off with a workshop conducted by three personages in the cosplay community – celebrity cosplayer Pinky from Indonesia, Elizabeth from Haru House, and Reno from Movie Mania, who shared some great cosplay protips. This was followed by a red carpet parade featuring some 50 cosplayers in their finery, performances by Elizabeth and the Haru Stars, and the cosplay contest proper. There was a total of 13 entries, comprising both group and solo acts, and they did their damnedest – from staging sword fights, cute dances and re-enactments – in a bid to win the judges’ favor. The Gintama team, which put on a melee sequence clinched the 2nd Runner Up prize, while Iwasaka Megumi waltzed off with the 1st Runner Up in her elaborate Cantarella gown. The champion was AzureWind, who channeled the quintessential Singaporean in his portrayal of the Ainu (native Japanese) elementalist Horohoro from Shaman King. His 5-minute long skit was interspersed with local patois and slapstick humor (including a reference to text messaging), and even prop failure (his wig flopped off at the very end) didn’t keep him down. The Games Xpo (TGX) 2011 opened its doors Friday, drawing both e-sports enthusiasts and gaming fanatics to far-flung Changi for a weekend that promised plenty of gaming fun. Into it’s third year running, the event saw countless visitors flocking to Singapore Expo, to take part in both World Cyber Games, as well as trade and business meet-ups. TGX also saw loads of cosplayers, who flocked to the scene to soak in the atmosphere. While Crimson was casing out the booths, our convention spy Kah Wee was making the rounds, snapping pictures of cosplayers. Saturday also featured Cos X, a mini cosplay contest with more than 20 participants in costumes including Mordekaiser from League of Legends, Hunter from L4D and Ezio from Assasin’s Creed series. Our friends at Operation P?Ani?C filmed the entire cosplay segment, so do drop by their webby if you’d like a look at those videos [P1] [P2]. Do support them if you like their work! The Smoke devastates a city and chokes the life out of its inhabitants. It kills the world’s only superhero – Vanguard, the bulk of the population, and leaves the remainder horribly warped and scarred. 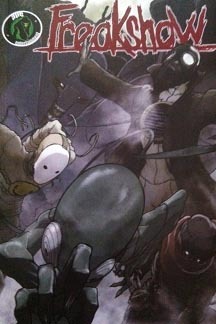 Struggling to survive within this post-apocalyptic framework are the heroes of Freakshow – a group of five individuals who’ve found themselves suddenly gifted, or perhaps cursed with super powers of their own. This motley crew has banded together, both to fight against military tormentors who have put the ruined city under quarantine, as well as to hunt down their leader, the enigmatic Dr. Gaghen. It’s not an altogether unfamiliar story, but thanks to independent comic book writers David Server and Jackson Lanzing, Freakshow’s vibe is decidedly dark, and that’s what sets it apart from all the other titles out there. There’s certainly plenty of moral ambiguity in the mix, and plenty of twists to keep audiences guessing. 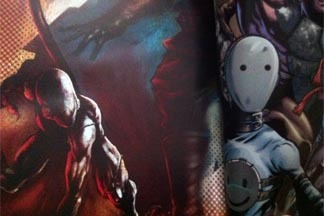 And some killer character designs. It also features great art, courtesy of Joe Suitor. Suitor’s rendition of the characters – all ephemeral, tortured and twisted, were perfect for the story’s sinister tone. It’s complemented by his painting style, his devotion to detail, and clever use of color. His mastery of paneling is also impressive. Action flows from frame to cinematic frame, creating seamless story flow. 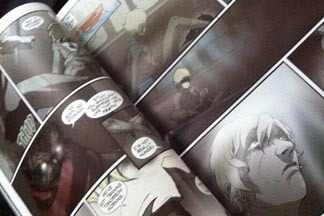 Freakshow stands as a testament to quality creator-owned work. Definitely worth a read, and then some.